On the Housatonic River there are signs warning people not to eat fish, frogs, turtles and ducks because of PCB contamination. The U.S. Environmental Protection Agency has given people until this Monday to comment on a $613 million plan to finish a toxic waste clean up of the Housatonic River. General Electric would foot the bill. The company had a factory on the river in Pittsfield where, up until the 1970s, it released PCBs, a chemical compound now linked to cancer. In 2000 GE signed an agreement to clean it up, and there’s a debate over whether removing the PCBs will protect the environment or hurt it. At one time it seemed like PCBs were everywhere in Pittsfield. In the mid-1990s resident Barbara Cianfarini learned dozens of backyards were contaminated. Walking above the Housatonic River today she points to a stretch south of the old GE plant that’s been cleaned up. “So if you look right in there you can see a little patch of water, you can see it running down there,” Cianfarini says. Congress banned PCBs or polychlorinated biphenyls in the late 1970s. Up until then, for decades, G.E. used them to make electrical transformers. Cianfarini, who helped start the group Citizens for PCB Removal, remembers smelling the PCBs. Pittsfield is cleaner now. Cianfarini says in the seven years since the EPA and GE dug up PCBs from the first two miles of the river, the plants and animals have returned. Today, downstream, a very different stretch of polluted river has yet to be cleaned up. The EPA’s plan covers 15 miles that flow past a state forest, an Audubon Sanctuary and the town of Lenox, home to Tanglewood. Back in 2011, as the EPA was working on its plan, the state of Massachusetts criticized the federal agency for proposing to dig up PCBs where there are rare species. Curt Spalding, who heads up the EPA in New England, says the EPA’s plan has shifted. He’s referring to the federal criteria designed to protect human health and the environment. Spalding says the plan removes enough PCBs so that, eventually, the fish will be safe enough to eat. PCBs, which settle in the soil, are ingested by insects, which are consumed by fish. Other animals, including humans, eat the fish and get exposed to the toxin. The Massachusetts Department of Environmental Protection declined to be interviewed at this point in the process. General Electric released a statement referring to “significant flaws” in the plan. Six towns in the area are concerned about the economic and social impacts. 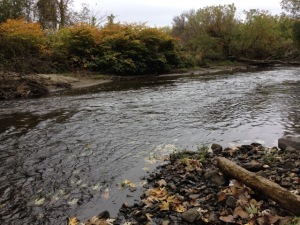 In Connecticut, where the Housatonic flows into Long Island Sound, a state biologist says the plan does a good job addressing the reduction of PCBs that come down stream. The public is also divided. 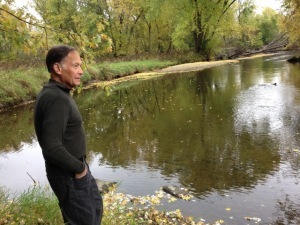 Jeffrey Cook has lived in the Berkshires near the river for decades. He acknowledges removing PCBs could help wildlife. “But the human health risk is enormously overstated and most of us really think it’s a lot of baloney,” says Cook, who leads a group that’s concerned about the EPA’s plan. Cook lives in a house overlooking an expansive floodplain and miles of tangled wetlands. He says the landscape will be destroyed. 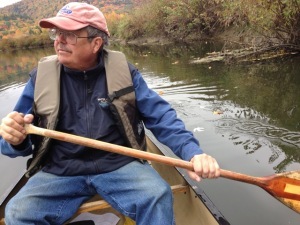 South of here, Tim Gray of the Housatonic River Initiative, is paddling past October Mountain, admiring the fall colors. Gray has been fighting for a thorough clean up for nearly 40 years. He says the EPA’s plan doesn’t clean up enough PCBs. “We find it absurd that we want to leave super-high levels of PCBs in there that are not good for these state-listed species, especially the animals,” Gray says. Gray admits a clean up is a construction project, but he points to the PCB removal in Pittsfield as proof that the river can recover. He wants the EPA to slow down and test new ways to treat and destroy PCBs without hurting habitat. Once the EPA finalizes its plan, GE has the right to dispute it. Either way, it could be years before the cleanup begins.